The steel rebar market is projected to reach USD 154.08 billion by 2021, at a CAGR of 5.0% from 2016 to 2021. The demand for steel rebar can be attributed to the rising demand from different end users. Steel rebar in infrastructural projects is used for the construction of bridges, pavements, water sewage systems, airports, highways, and stadiums. In this study, 2015 has been considered the base year and 2016-2021 as the forecast period to estimate the steel rebar market size. The demand for steel rebar can be attributed to the rising demand from different end users. Steel rebar in infrastructural projects is used for the construction of bridges, pavements, water sewage systems, airports, highways, and stadiums. In the housing sector, rebar are used in the construction of independent houses, schools, hospitals, residential apartments, and commercial shopping complexes. In the industrial sector, steel rebar are used in the construction of industrial warehouses, factory sheds, power plants, and in the oil & gas industry. Rising investments in public housing projects and need for better infrastructure in emerging economies are expected to drive the demand for steel rebar from different end users. Different secondary sources, such as company websites, encyclopedias, directories, and databases such as Hoovers, Bloomberg, Businessweek, Factiva, and OneSource have been used to identify and collect information useful for this extensive, commercial study of the steel rebar market. Primary sources, including experts from related industries, have been interviewed to verify and collect critical information and assess prospects of the market. The top-down approach has been implemented to validate the market size in terms of value. With data triangulation procedures and validation of data through primaries, the exact values of the overall parent market size and individual market sizes have been determined and confirmed in this study. This study answers several questions for stakeholders, primarily, which market segments they should focus upon during the next two to five years to prioritize their efforts and investments. 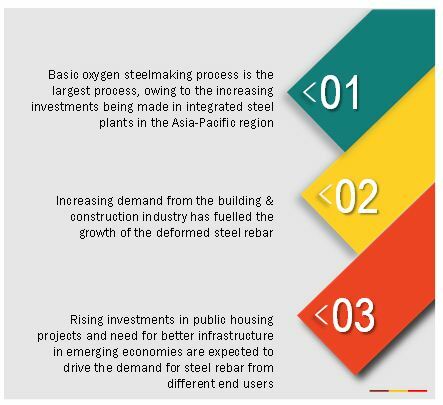 These stakeholders include steel rebar manufacturers such as ArcelorMittal (Luxembourg), Gerdau S.A (Brazil), Nippon Steel & Sumitomo Metal Corporation (Japan), Posco SS-Vina, Co. Ltd (Vietnam), Steel Authority of India Limited (India), Tata Steel Ltd. (India), Essar Steel (India), Mechel PAO (Russia), EVRAZ plc (U.K.), Sohar Steel LLC (Oman), Celsa Steel U.K. (U.K.), Kobe Steel Ltd. (Japan), Jiangsu Shagang Group (China), NJR Steel (South Africa), Commercial Metals Company (U.S.), The Conco Companies (U.S.), Barnes Reinforcing industries (South Africa), Jindal Steel & Power Ltd. (India), Steel Dynamics (U.S.), Steel Asia Manufacturing Corporation (Philippines), Outokumpu Oyj (Finland), Acerinox S.A. (Spain), Hyundai Steel (South Korea), Daido Steel Co., Ltd. (Japan), and Byer Steel (U.S.). In October 2016, ArcelorMittal Brasil S.A. and Votorantim S.A. signed a definitive agreement for long steel business. Under this agreement, Votorantim Siderurgia will work as a subsidiary of ArcelorMittal Brasil S.A. The agreement will help the company to increase its crude steel capacity of 5.6 million tons and annual rolling capacity of 5.4 million tons. In September 2015, Gerdau supplied 16,500 tons of steel including reinforcing steel bar for the Tampa International Airport expansion. The project is ongoing and is expected to be completed by the end of 2017. This will help Gerdau in supplying more steel for further expansion in the Tampa region. This research report categorizes the steel rebar market on the basis of type, process, end user, and region. The report forecasts revenues as well as analyzes the trends in each of these submarkets. Each class is further described in detail in the report with value forecasts until 2021. Each type is further described in detail in the report with value and volume forecasts until 2021. Each end-use industry segment is further described in detail in the report, with value forecasts until 2021. Each region is further segmented by key countries, such as China, India, Japan, South Korea, the US, Mexico, Canada, Germany, the UK, Italy, France, Spain, Egypt, Iran, Qatar, Colombia, and Brazil. The steel rebar market is projected to reach USD 154.08 billion by 2021, at a CAGR of 5.0% from 2016 to 2021. The key factor driving the growth of the steel rebar market is the rising demand for steel rebar for construction projects from various end users such as the infrastructure, housing, and industrial segments. The major types of steel rebars are deformed and mild steel. Deformed is the largest and fastest-growing market, owing to its deformed surface which helps in the bond between materials and minimizes slippage in concrete. The steel rebar market by end user has been classified into infrastructure, housing, and industrial segments. Infrastructure is the largest and fastest-growing segment, as steel rebar is widely used in infrastructure projects which include bridges, highways, dams, and stadia, among others. The steel rebar market by process is classified into basic oxygen steelmaking, and electric arc furnace. The basic oxygen steelmaking segment is the largest and fastest-growing segment in this market, owing to its superior characteristics such as high production rate, steel with low nitrogen content, and requiring less labor. 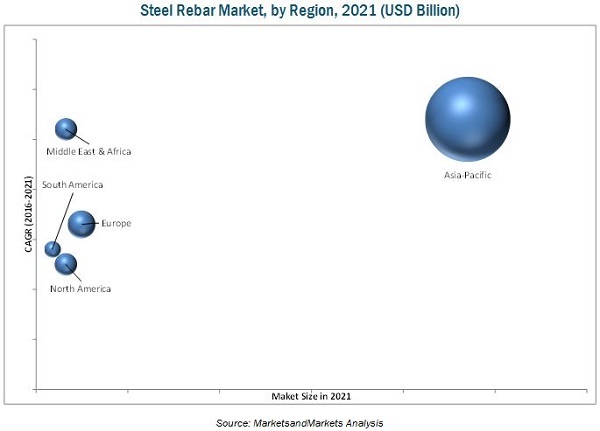 Asia-Pacific is the largest market for steel rebar due to the growing economies, and increasing construction projects. The growth of the Asia-Pacific steel rebar market can be attributed to increase in the consumption of infrastructural, and housing projects by construction industries. The Asia-Pacific steel rebar market is expected to grow at the highest CAGR between 2016 and 2021, and includes countries such as China, Japan, India, and South Korea. The market in this region is witnessing increased consumption of steel rebar for construction projects initiated by governments and private sectors. Infrastructure is a major end user of steel rebar. This sector includes all projects of roads, highway and bridge construction, sewage systems, airports, and stadiums. The use of steel rebar increases the tensile strength of surrounding concrete structures in highway bridges and pillar structures. Nowadays, project contractors are using advanced steel rebar with galvanized coating to prevent from corrosion to be used in critical highway projects. The availability of such advanced steel rebar coating makes it one of the most durable products for infrastructural projects. The housing sector is the second largest consumer of steel rebar in the world. This segment includes all major housing, real estate, schools, hospitals, and commercial shopping complexes. Steel rebar is an important constituent in these construction projects. Growing urbanization and migration of people from rural areas to urban cities are important factors driving the housing sector. This trend is expected to be prominent in emerging economies such India and China, which makes Asia-Pacific the largest region for housing segment of steel rebar. However, the demand for housing in developed countries is dependent on the credit growth and investment returns of the real estate sector. The Middle East & Africa is expected to be the fastest growing steel rebar market for housing due to the extensive demand from the housing segment, which includes residential complex, shopping malls, hospital, buildings, and other housing projects. The industrial segment includes all construction projects in the energy and power industry, water treatment plants, industrial warehouses, oil & gas construction, and telecommunication infrastructure. The demand for steel rebar in hydropower projects, industrial warehouses, and cold storage units are expected to be significant as compared to other end-use industries. What are the upcoming industry applications for steel rebar? The future demand for steel rebar is expected to be hampered due to certain challenges, for example overproduction of steel rebar from China, and increasing dumping activity. Key companies operating in the steel rebar market include ArcelorMittal (Luxembourg), Gerdau S.A (Brazil), Nippon Steel & Sumitomo Metal Corporation (Japan), Posco SS-Vina, Co. Ltd (Vietnam), Steel Authority of India Limited (India), Tata Steel Ltd. (India), Essar Steel (India), Mechel PAO (Russia), EVRAZ plc (U.K.), Sohar Steel LLC (Oman), Celsa Steel U.K. (U.K.), Kobe Steel Ltd. (Japan), Jiangsu Shagang Group (China), NJR Steel (South Africa), Commercial Metals Company (U.S.), The Conco Companies (U.S.), Barnes Reinforcing industries (South Africa), Jindal Steel & Power Ltd. (India), Steel Dynamics (U.S.), Steel Asia Manufacturing Corporation (Philippines), Outokumpu Oyj (Finland), Acerinox S.A. (Spain), Hyundai Steel (South Korea), Daido Steel Co., Ltd. (Japan), and Byer Steel (U.S.). These players are engaged in the manufacture and supply of steel rebar and have a strong regional presence. 11.10 Jindal Steel & Power Ltd.